IMMA 1000 fund raises €120,000 in year one, announces four new artist residencies and three new purchases, all by female artists, to the National Collection. At a launch in Dublin tonight, IMMA (Irish Museum of Modern Art) announced a number of key purchases, all by female artists, to the IMMA Collection. Also announced were four new IMMA 1000 residencies, each of which carries a bursary for artists alongside free accommodation and studio space at IMMA. The first three acquired works are The weakening eye of day by Isabel Nolan, A Reflection on Light by Grace Weir and Meaning of Greatness by Sarah Pierce. Nolan and Weir’s works were both first shown in IMMA as part of exhibitions in 2014 and 2015 respectively. IMMA’s Collection is the National Collection of Modern and Contemporary Art, however funding cuts over the last decade have severely restricted the Museums ability to purchase new works. Two new initiatives, IMMA 1000 and The Hennessy Art Fund for IMMA Collection, are now allowing for new acquisitions for the first time in many years. Philanthropy can act as a very positive complement to the core funding provided by my Department for our Cultural Institutions. I would like to commend IMMA for undertaking this proactive initiative which is helping to harness investment in its collections from private individuals and the private sector. In recognition of the philanthropic nature of this fund, and the great work done by IMMA in raising these funds from the private sector to date, I am pleased to provide match funding for the acquisitions fund. As recognised in the Creative Ireland Programme, our National Collections are invaluable cultural resources for our country, and I am delighted to support this initiative which will see a number of new works joining the National Collection in 2017. We are delighted to announce that we have reached our ambitious target of raising €120,000 in year one. That’s €120,000 that we have been able to use to directly fund individual artists for their work in three major ways – throughout the 2016/2017 programme, through a series of new paid residencies announced tonight for 2017 and three new acquisitions for the IMMA Collection. Museums can support artists in many different ways and I am delighted that through the extraordinary success of IMMA 1000, and the additional support by the Department, we have been able to support so many Irish artists works across our programmes and through our residency; providing much needed space and support for artists to think, reflect and develop new work. 1) Supporting artists to live and work in Ireland through bursaries and the IMMA residency programme. 2) Supporting artists’ income through commissions and exhibitions. 3) Supporting artists’ work through the purchasing of work for the IMMA Collection. Goodbody has high regard for IMMA and the work it does. We believe artists deserve a secure place in Irish society,” said Roy Barrett, Goodbody Managing Director. “Goodbody wants to help to build and sustain the cultural institutions that make art viable in Ireland. IMMA 1000 is a project of real ambition that we are honoured to support. IMMA 1000 was conceived on behalf of IMMA by businessman John Cunningham, Director CheckRisk, who responded to a talk by the IMMA Director to a group of business leaders in 2014. He was struck by the critical difficulties, outlined by Sarah, facing artists in Ireland following the economic crisis and committed to personally raising funds for the future. For more information and images please contact monica.cullinane@imma.ie or press@imma.ie 01 612 9922. Photos will be issued at 7.30pm this evening by photographer Ruth Medjber. Substantial cuts in arts funding since 2008 have had a devastating effect on supports available directly to contemporary artists. Arts organisations such as IMMA have also seen cuts of close to 50% in their state funding resulting in fewer acquisitions for public collections, fewer commissions of new work and reduced artist fees. 1) Three new acquisitions for the National collection; The weakening eye of day, 2014 by Isabel Nolan, A Reflection on Light, 2015 by Grace Weir and Meaning of Greatness, 2006 by Sarah Pierce (details on each work below). 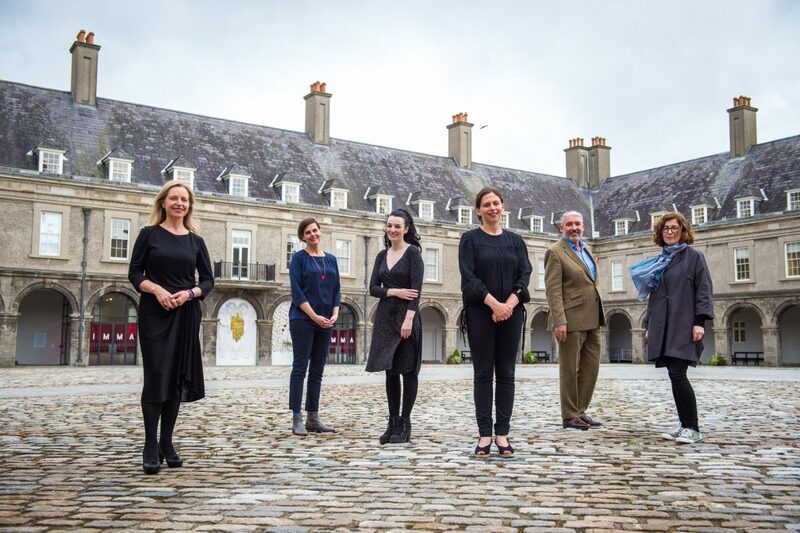 2) Four new residencies at IMMA with associated bursaries for artists. There will be one year-long bursary, with a stipend of €10,000 and three 6-month long residencies to the value of €6,000 each, which will include bursaries and associated travel and production expenses. The IMMA 1000 residencies will each commence in 2017 and will be filled through a combination of open call and invitation-based processes. Information will be published on the IMMA website and social media, and sent directly to the Artist Residency Programme emailing list which can be joined via the IMMA website. About IMMA IMMA (Irish Museum of Modern Art) is Ireland’s national institution of contemporary and modern art. The third most visited free attraction in Ireland (2015) IMMA is celebrated for its vibrant and dynamic exhibition and education programmes. IMMA is the home of the National Collection of Modern and Contemporary Art. Now numbering over 3,500 works, we ensure that this collection is accessible to visitors to IMMA and beyond, through exhibitions, collaborations, loans, touring partnerships and digital programmes. Visited by over 580,000 people in 2016, IMMA is one of Ireland’s leading cultural institutions and a key source of creativity and inspiration for visitors of all walks of life. One out of every ten IMMA visitors experiences visual art for the first time through their IMMA visit and it is hugely important to us to create an enjoyable and engaging experience of contemporary art for everyone. We are driven to inspire a curiosity and appreciation of Irish contemporary art amongst our audience and the wider Irish public. Above all else we are committed to supporting artists’ work. Together with artists and other partners we work to support the development of contemporary art in Ireland. As Ireland’s contemporary visual artists continue to strengthen their work is increasingly recognised on the international stage as well as making an invaluable contribution to contemporary Irish society. Artists are a key voice in any contemporary society and IMMA is committed to supporting Irish artists’ ability to live and work in Ireland. A Dublin based artist Isabel Nolan’s work encompasses sculpture, textiles, paintings and works on paper and writing. Recent solo exhibitions include ‘The weakened eye of day’ at Contemporary Art Gallery, Vancouver and Mercer Union, Toronto, both in 2016, which originated at IMMA (2014), Galerie Krinzinger, Vienna (2016), Sean Kelly Gallery, New York, (2014); Goethe Institut, Dublin (2012); The Model, Sligo (2011-12), and Museé d’art moderne de Saint-Etienne (2012). Other solo shows include: Kerlin Gallery, Dublin (2007; 2009; 2015); Project Arts Centre, Dublin (2005): the Studio, Glasgow International (2006); Douglas Hyde Gallery, Dublin, (2007) and Artspace, New Zealand (2008). Nolan represented Ireland at the 2005 Venice Biennale in a group exhibition. Her work has also featured in Launchpad Art, London; LIAF biennial (Lofoten International Art Festival), Norway; Artspace, Sydney; Palais de Tokyo, Paris; Scottish National Gallery of Modern Art; Beijing Art Museum, The Yugoslav Biennial for Young Artists, Serbia-Montenegro; Glasgow International; and the Mediation Biennale, Poznan, Poland. Forthcoming exhibitions include a solo show at The Douglas Hyde Gallery, Dublin, and at Grazer Kunstverein, Graz, (both 2017) and at the San Antonio Museum of Art, (2018). Nolan is represented by Kerlin Gallery, Dublin and Krinzinger Gallery, Vienna. A steel squiggle, almost unruly, but not quite, stitched into a skin of grey wool, unfolds in large loops across a room. It is larger than a human but not overwhelming. The form unwinds slowly, breaking and bridging the space, at one end turning back on itself where it meets the floor. The material world we inhabit, the given and the constructed, is far more various and much stranger than any single or even gathering of artworks ever can be. Much of my work rides a tension between the intimacy of an up-close material encounter and allusions to vast abstractions such as infinity or extended geological time frames. ‘The weakening eye of day’ steals its title from a poem wherein the phrase is used to describe the sun in winter. The sculpture is strong and soft, quietly, insistently leading both the body and the eye. It works well as metaphor but it isn’t merely a signifier for something like the dissipating energy of a dying sun, or the path of single particle, it has its own mute narrative and peculiarity, making a place for itself within the everyday weirdness of the world. Since 2003, Sarah Pierce has used the term The Metropolitan Complex to describe her art. Despite its institutional resonance, this title does not signify an organisation. Instead, it demonstrates Pierce’s broad understanding of cultural work and processes of research and presentation that highlight a continual renegotiation of the terms for making art. Her focus is on archival materials and reproductions, student work and test pieces, gesture and repetitive address. Pierce uses a range of media, often making work with other artists, actors, teachers and students in collaborations that draw upon historical relationships to the political: the potential for dissent and self-determination, slippages between individual work and institution, and the proximity of past artworks. Recent solo exhibitions include: No Title at CCA Derry (upcoming 2017); Pathos of Distance at the National Gallery of Ireland (2016); Lost Illusions at SBC Gallery Montreal, Mercer Union Toronto, and Walter Phillips Gallery Banff (2014); and The Artist Talks The Showroom London (2013). Selected group exhibitions include: Rua Red Tallaght (2017); CCS Bard Hessel Museum Annandale-on-Hudson NY (2016); P! New York (2016); Van Abbemuseum Eindhoven (2016); IMMA Dublin (2016); NCAD Dublin (2012); Mattress Factory (2011); K21+20 Düsseldorf (2011); MUMOK Vienna (2009); MuHKA Antwerp (2007); and recent biennales, including Eva+ International Limerick (2016, 2014); Lyon (2011); Sinop (2009); and the 51stVenice Biennale commissioned by Sarah Glennie for the Irish pavilion (2005). A meditation on time and the nature of light ‘A reflection on light’ consists of a seemingly single long take that weaves together events from different histories and disciplines that orbit a painting whose subject is light by the Irish Cubist artist Mainie Jellett. “The whole film is shaped by a series of long tracking shots that take us slowly around three buildings: the interior of an apartment owned by the artist Mainie Jellett, a gallery space at IMMA, and the department of physics at Trinity College. The tracking shots may move us forward in a linear fashion but Weir demonstrates how we weave other dimensions of time and space into our daily consciousness. Perhaps what the film demonstrates is just how light, time and space are transformed as they pass through another medium: the lens of the camera. Grace Weir, has linked the ‘I’ of the maker to the eye of the camera as she rotates a work through time and space. Her film elaborates something…which is the perpetual motion of human consciousness: an ever-evolving perception and interpretation of the world around us.” Francis McKee.